Our DIY Kit is ideal for small paving projects or incorporating designs, such as your house number or name, into pathways and driveways. With the exact amount of specially formulated resin and natural aggregate, recycled glass or marble to complete ½m² to a depth of 16mm, a DIY Kit is ideal for small areas. Without the need for expensive cutting or laying equipment, each paving kit comes with detailed instructions that guide you through preparation, mixing and laying SureSet resin bound gravel. 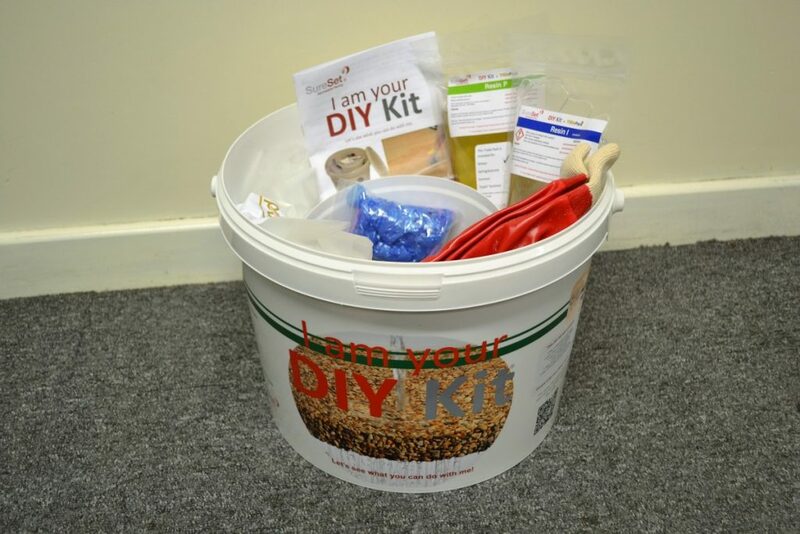 The average cost of our DIY Kit (13kg) is £29.95 (including VAT and UK mainland delivery). Please note that orders of eight or more DIY Kits will be delivered on a pallet and so you may require assistance. With one-click, you can buy DIY Kits and TradePacks via our online shop. Our APP is available to download from Google Play and the Apple Store.